June 2012: Tips, eNews & More! Summer is known by many names around our office, Patio/BBQ Season Wedding Season, Baseball Season and countless other names that turn friends and family members into virtual paparazzi. Summer is a great time to discuss the smile of your dreams. From Whitening to a complete smile makeover, you deserve a beautiful smile. Happy Father's Day June 17th. Wishing all the fathers a wonderful Father's Day! Celebrate and honor your fathers, paternal bonds, and the influence of fathers in our lives. Lawrence West Dental will be closed for summer holidays June 25th to July 2nd. The office will be open for business on July 3rd. 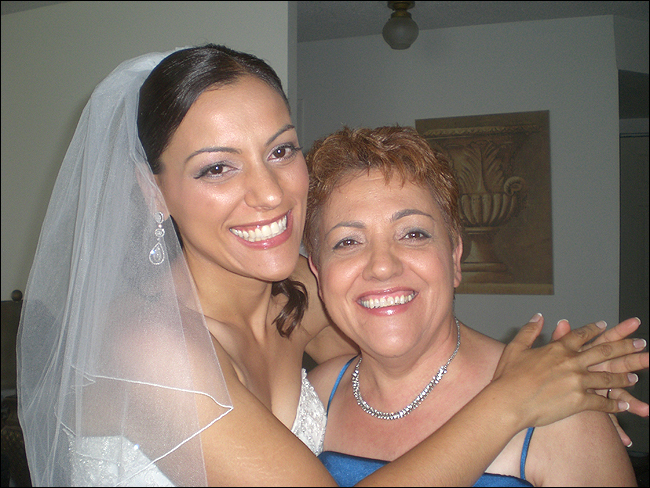 The Winner of our Most Memorable Moments with your Mom Contest is...... Jenny Benincassa. Congratulations!! Thank you to all the participants. We had an incredible number of beautiful photos sent to us thus making it very difficult to select one winner of the $100 gift card to Best Buy. Our amazing receptionist Lisa just got back from Cuba. As you can see from the photos she had a great time! When wisdom teeth begin to erupt the flap of gum tissue that grows over the tooth is raised, creating a space for food to become trapped which can cause infection. Another common complication is misalignment of the wisdom teeth. Misaligned wisdom teeth can be angled towards or away from the second molars. This often causes the tooth to become 'impacted' only erupting partially and not erupt to the surface at all. This improper alignment can cause crowding and potentially damage adjacent teeth, the jawbone or nerves. Early detection through dental x-rays allows us to predict future problems and prevent them, often through removing the misaligned or 'impacted' wisdom teeth. Our team will keep a close eye on the development of your wisdom teeth during your regularly scheduled visits. Bank of Canada decided to leave the Key Lending Rate flat. This is in stark contrast to 6 weeks ago, where the rhetoric was "rates are going up, and soon." But since then, the ongoing economic turmoil in Europe and weaker than expected U.S. employment numbers, have added up to renewed Global uncertainty. So what began as a quiet whisper, just days ago, is now a growing opinion that the Bank of Canada may even trim the Key Rate - down. The other side of the coin - low mortgage rates continue to be a plus for homeowners, homebuyers, and sellers too. Also according to reports from the Big Five and Bank of Canada, Consumer debt is beginning to correct too. On another note, OSFI is about to announce a major set of guidelines for Federally Regulated Lenders that will affect mortgage lending and reach renewals too. Some of the ideas they have floated in public have raised eyebrows. More to come as the facts become known.